How did you get physically fit enough? Following three operations (for a back injury) and countless procedures, I started a comprehensive treatment and training programme in June 2013, with the aim of participating in the expedition in April 2015. My first run lasted a mere 15 seconds, enabling my body to experience and adjust to running. In total, I did more than 1,000 kilometres running and 650 hours of training and treatment. In the final four months, my preparation involved putting on a harness and dragging a car tyre for hours every weekend. Tell us about your journey. My personal journey took nearly two years. The logistics of getting to the North Pole are a little more straightforward. We were away for a little more than two weeks. We flew from London to Oslo (1,208km), then Oslo to Svalbard Longyearbyen (2,015km), which is the frontier for the Arctic Circle. After a couple of days sorting our expedition pulks, we embarked on the final leg of our journey in a Russian Antonov plane bound for Barneo ice camp (1,065km). Landing on a "drifting" ice runway – which is in existence for three weeks only, with a changing location due to the sea currents – can’t be the easiest of tasks for the Russian Air Force. After a night at Barneo, we had a short helicopter ride courtesy of the Russian Geographical Society and were dropped at 89 degrees. Here, we were left alone to navigate our way north to 90 degrees: the Geographic North Pole. What were the biggest challenges? Protecting my injured back, experiencing cold like nothing I could’ve imagined (-47 degrees at its coldest), the 24-hour daylight, undertaking everyday tasks in hugely challenging conditions, and the sheer exhaustion of negotiating the ice boulder fields. How did you feel once you reached the North Pole? Emotional. 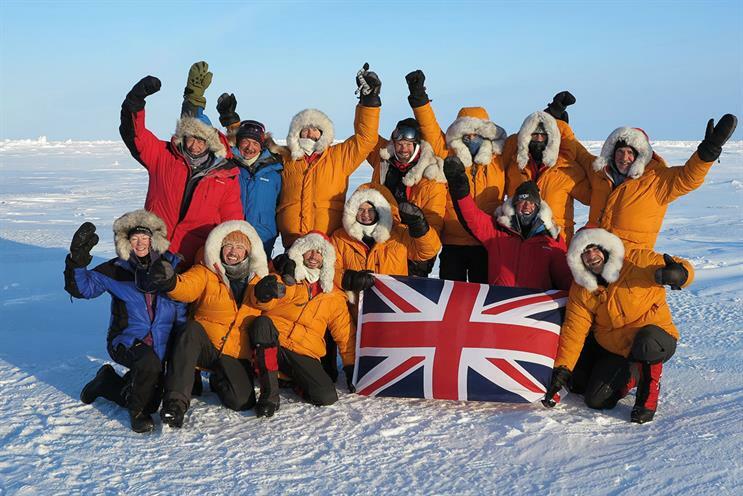 Hugely relieved to have made it, utterly exhausted by the journey, but carried by the camaraderie of a team working together in an environment where we are simply not supposed to survive. What does it look like? Unlike the South Pole, which is fixed point, the North Pole is on an ice cap, which means a constantly changing location. Arrival is simply determined by the GPS location of 90.00.00 N. It looks exactly like the snow and ice experienced every day of the expedition, except you are literally on top of the world.